As of April 2018, Sense of Touch tops the Amazon Kindle Store Best Seller list in Renaissance History. Sense of Touch: Love and Duty at Anne of Brittany’s Court is an exquisitely written historical fiction novel by Rozsa Gaston. Set in the late 1400’s, the story of Anne of Brittany, Queen of France, is told through the eyes of fifteen-year-old Nicole St. Sylvain, a member of Anne’s court. Through Nicole we witness the tragedies Anne faces due to the loss of five of her children and how she perseveres through those losses. As daughter of a wealthy merchant and noble through her mother, Nicole is the sole heir to her family’s money, meaning she must marry into a well-founded noble family to secure her future. However, when she falls in love with a young horse trainer, Philippe de Bois, the plans her family has for her changes everything she has begun to hope for. As her relationship with Philippe begins to grow, Nicole also discovers that she has been given the gift of healing. With this gift, Nicole must attempt to heal the royal child, securing her place in court and giving her hope that she may be rewarded with what she truly desires. Although the story of Anne of Brittany’s life is devastatingly tragic, the way in which this story is written tells her tale with great reverence without completely shattering the reader’s emotions. Nicole’s first person narration demonstrates the magnificent strength and perseverance that Anne carries throughout her life, all while continuing with her role as Queen of France. Anne’s role, not only as Queen in Nicole’s life: but complete roll model, confidante, and friend nurtured Nicole in ways that she had never expected. Sense of Touch is a beautifully written novel that will transport the reader back in time, giving the reader a wonderful appreciation of what life was like in late Medieval France. The dialogue never leaves the reader in a dull moment and sets a strong steady pace for the entire novel. One will feel great compassion for Anne’s struggles in life all while cheering for Nicole as she discovers the person she is meant to become. The secondary characters, although not as prevalent, greatly fill out the story, leaving a well-rounded novel. The book itself is well edited, creating a very well composed novel and leaves the reader satisfied in their own role in the story. I don’t know if I can express how much I thoroughly enjoyed this novel, the premise was incredibly intriguing, although I was somewhat hesitant due to how tragic Anne’s life was, I was pleasantly surprised how upbeat the novel was. I had a very hard time putting the novel down and ended up reading it in just a couple of sittings. 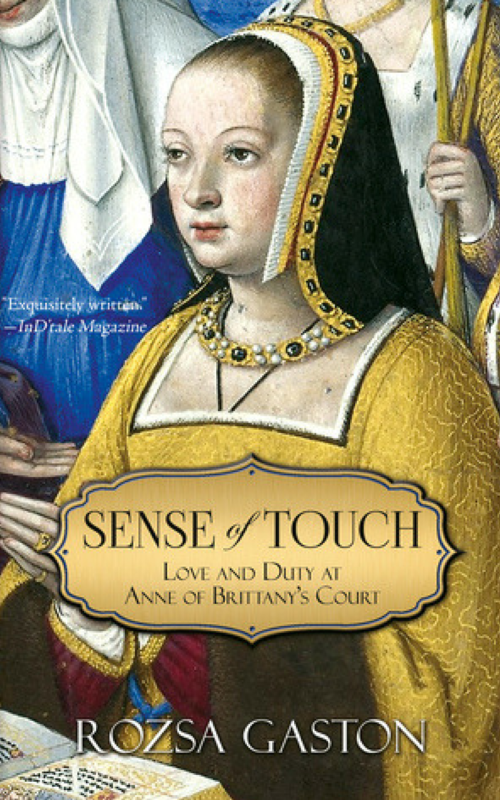 I give Sense of Touch: Love and Duty at Anne of Brittany’s Court a 4 out of 4 stars. This incredible novel will touch anyone who reads it, whether they are fans of historical fiction or not. Jenerated Reviews weighs in on SENSE of TOUCH with five stars on Sept. 7, 2016. Award-winning British writer Duncan Whitehead, author of the bestselling The Gordonston Ladies Dog Walking Club gives SENSE of TOUCH five stars. Spend 60 seconds in the 1497 court of Anne of Brittany, Queen of France. Two lovers, duty-bound to part, pin their only hopes of happiness on a queen’s promise. Discover Anne of Brittany between the pages of SENSE of TOUCH, a fictional love story set in her court. Lucky in love, unlucky in childbearing, Anne of Brittany ruled with authority while winning the love of two kings and the admiration of all Europe. Her tale will stay with you forever. hi, i loved both Sense of Touch and Anne and Charles. 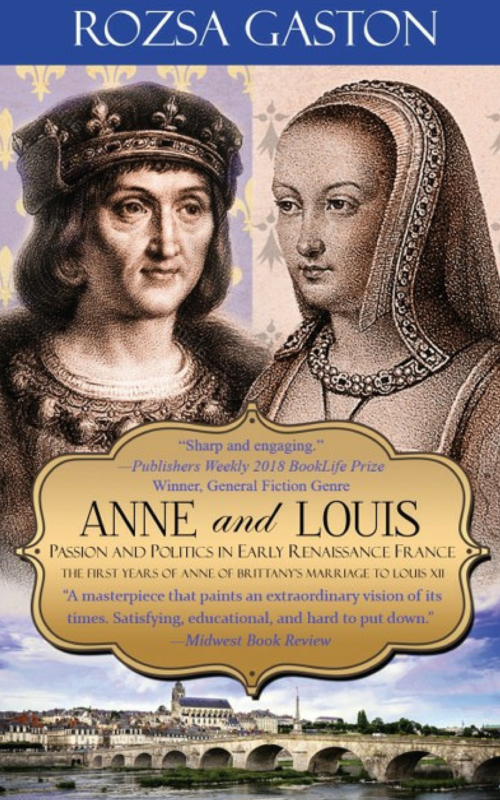 I wrote a review on Amazon for Anne and Charles, in excitement for your offer of the ebook of Anne and Louis. Next I’m going to get the Budapest book. I wish there had been books like this when I had to study history in school. You brought that era so to life, and made it relevant to so much humanness that is our joy and our plight today. Thank you for writing these! All best wishes and happy, long life to you! (I’m not on Facebook so I hope you get this instead of a post there). So nice to read your comment, Sarah Brennan, thank you for your review. I’ve got you in my datebook for Oct. 2018 release of Anne and Louis. As soon as it’s out, I’m sending the e-book your way. 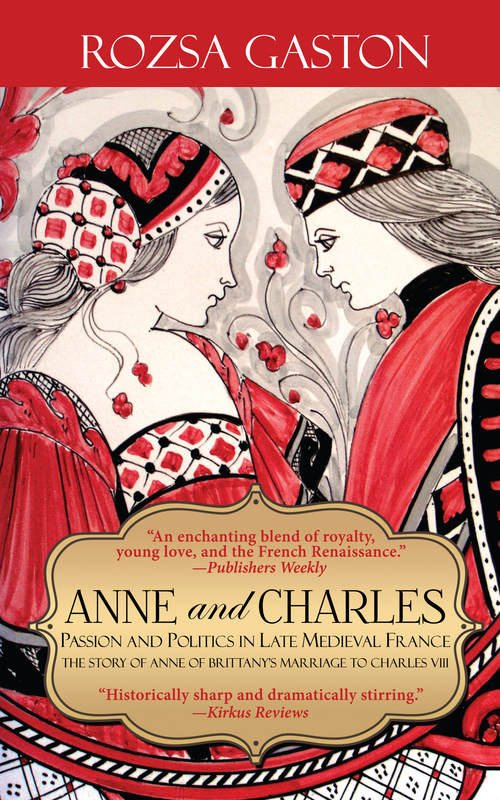 May fairy dust fall on your shoulders for letting readers know how much you liked Anne and Charles. Enjoy Budapest Romance! Anne of Brittany? Born Jan. 25, 1477, she was raised to rule and knew how to lead.